Obviously, a devastated admiralty tried all they could to preserve at least a modicum of naval air assets. So new large helicopter-carrying ASW vessels were proposed and ultimately approved. The ships were originally termed as „through-deck cruisers“ and became the Invincible class. No traditional carrier name was chosen to emphasize the ships Not Being Carriers. In the course of the lengthy design phase it was decided to equip the Invincibles with point-defence fighters against the Tu-95 „Bear“ maritime surveillance aircraft. To this end, a navalised version of the Harrier VTOL aircraft was developed and termed the Sea Harrier. To enable these aircraft to operate with useful payloads and in bad weather, the „ski-jump“ was developed while the lead ship Invincible was already building. Two years after the last carrier with fixed-wing aircraft had been retired, Invincible was commissioned in 1980, after successful trials. As a sign of a change in attitude she revceived the „R“ designation for a carrier instead of a „C“ for a cruiser, and her sisters were to receive the classical carrier names of Illustrious and Ark Royal. Yet the next wave of cuts was already rolling with the infamous Nott review of 1981, and amongst other severe cutbacks it included seeling Invincible to Australia, thus reducing the class to two vessels. Even while this was in the process of implication, Argentina invaded the Falklands. First Sea Lord, Admiral of the Fleet Sir Henry Leach, son of the Captain John Leach who was lost in the Prince of Wales in December 1941, intervened with the Prime Minister and convinced her of attempting to retake the islands, using Invincible and the older carrier Hermes as centerpieces of the Battle Group. Despite poor odds and thanks to tremendous commitment and powers of improvisation on the part of all concerned, the operation succeeded, leading to a reassessment of naval sea power and to a reduction of the proposed cuts. Two glaring defects of the fleet were soon rectified; Vulcan Phalanx automated close-in weapon systems were retrofitted to all three carriers, and an AEW version of the Sea King helicopter was introduced, both measures improving fleet defence a lot – had both been implemented earlier, probably a number of ships would not have been lost and many men would not have died. In the decades since their introduction, all three vessels of the class have seen numerous exercises, humanitary missions, but also combat missions. They were deployed to the Adriatic during the Balkan wars, to the Persian Gulf and the Indian Ocean during both Gulf Wars and the Afghanistan war. Successively they have been modernized with a view to squeeze as many aircraft into the given very limited space and to enhance their flexibility. These days, the ships can operate as classic light carriers, but also as commando carriers. Ark Royal has also been refitted to operate AH-64 helicopters. Invincible was de facto taken out of service in 2005; in 2006, the Sea Harrier was also stricken from the inventory due to poor performance in the warm climates most combat has taken place in the new century. Currently, and until the two (or maybe one?) new large carrier(s) are actually commissioned, Britain´s carrier fleet comprises the two remaining vessels of the class, equipped with helicopters and RAF ground-attack versions of the Harrier. Over the past 30 years, the Invincible class ships have developed from a stop-gap measure to very flexible and true carriers despite their small size. You need to go back to 1982 (yes, the Falklands, Helmut Kohl becomes our chancellor, The Conch Republic is declared, the first CD´s are sold) for the previous release of an Airfix warship kit, at least according to the Airfix Tribute Forum, and I regard them as pretty thorough. That was HMS Repulse, and coincidentally the to date last Airfix 1:600 kit. 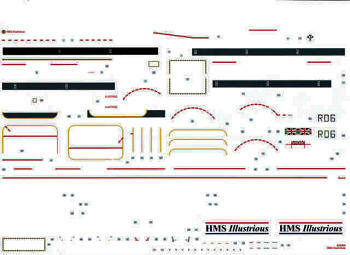 It took 27 years, almost as long as the Berlin Wall stood, until this kit of HMS Illustrious was issued. This vessel was probably chosen for her TV celebrity status from the Channel 5 series „Warship“. It is interesting to note the switch in scale to the currently booming 1:350. The strong and large box is rather heavy and packed to the brim. Sadly the sprues have not been sealed individually as most major manufacturers do today, that obviously leads to damaged parts. The kit comprises a bit less than 300 parts on five sprues. In my kit, all of them are crisply molded and free of flash. Despite some really sturdy parts, I found almost no sink marks – but there are some ejector pin marks in untoward places. The level of detail is pretty decent and in fact better than I expected, but it (yet) is not on par with the leading edge manufacturers. Nonetheless this is very welcome progress and and very useful base for a fine model! 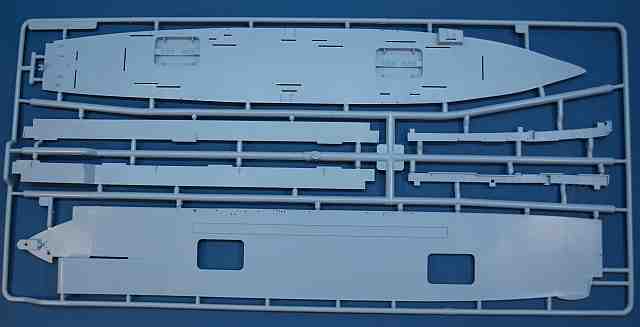 Sprue A contains the hull sides, some decks and the aircraft lifts. These can be positioned at one of three levels – a clever idea! 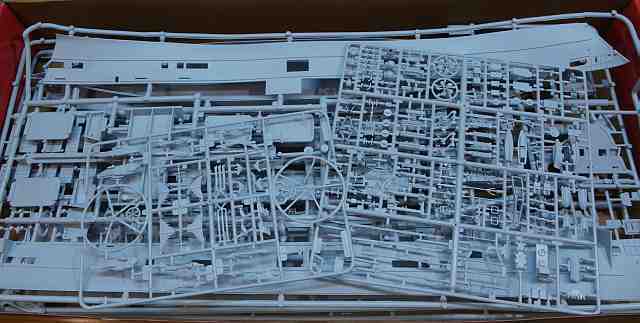 Sprue B is dominated by the one-piece flight deck and the hangar deck. These large parts look promising, not only because Airfix omitted exaggerated structures. Sprue C has lots of parts for the island, and the underwater hull. The walls of the island are fairly well detailed. The demarcation line of the lower hull is at the lower end of the boot topping which I regard as a splendid idea, as it eases building a waterline version. You virtually always see at least part of the boot topping, so having it at the lower hull means either gluing it on and cutting it off a bit below the demarcation, or adding some sheet to the hull. So I will probably leave the lower hull off for a waterline display. A lot of equipment is to be found in sprue D. Most notable are the sea boats, the davits, the Goalkeeper CIWS, the deck vehicles and the life raft canisters. The final sprue E comprises the sadly small air group. There are two Sea Harriers and two Harriers GR.7. This narrows the era down to between 2004 (Illustrious´ last major refit) and 2006 (the Sea Harrier´s retirement). Two Merlin and two Sea King helicopters complete the aircraft. One of each is to be depicted with folded wings. Sadly, the folded wings have only three instead of five blades. The very visible Searchwater radome of the AEW Sea King had been omitted. generally speaking, the aircraft are fairly well-detailed, with some questionable aspects like the molded-on missile pylons on the Harriers and the pretty clunky sponsons of the Sea King. The recessed panel lines are rather on the heavy side. I assume that some TLC with Mr Surfacer should tone them down enough to work fine under a coat of paint, or some. All the aircraft should build well and provide a good starting point for whatever detailing you should intend to perform. In my eyes, the most serious drawback is the sheer lack of aircraft. There is yet the possibility of Airfix selling the aircraft sprue as a separate detail set, which would be both easy and logical for them, but this has yet to materialize, a year after the kit was issued. The kit instructions are almost perfect. After the sprue layout, construction is shown in numerous and clearly arranged steps. Colour callouts are Humbrol numbers, as usual. My only area of dissent is in the construction sequence: I would never add the lower hull as late as shown, let alone after gluing the shafts, props and rudders to it. Apart from that, the sequence is logical. The large decal sheet is well-printed and seems in register, something not exactly a given in earlier Airfix offerings – I obviously will only be able to tell you how they work as soon as I do work with them. The complex flight deck markings are nicely reproduced, so this sheet should help up the model a lot. To ease painting and decal placement, a colour profile has been added showing all you need to know concisely. 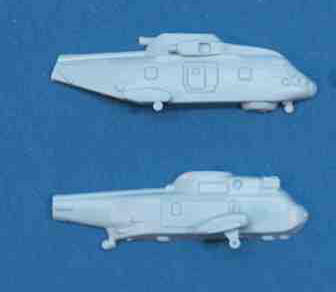 This is yet another strong point of the kit, compared with the classic Airfix ships. This profile contains all the colour callouts both in Humbrol and in British Standards. All in all this is a highly recommended kit of a very interesting class of ship. Airfix has proven their intent to do something more than rebox and reissue, that they are working to improve their offerings and to narrow the gap between their offerings and today´s best ones. Even though this is no Dragon Smart Kit, I don´t mind a bit. I´m sure this will be an enjoyable build and one with tons of potential!